The spotlight is on women's golf this week with three exciting tournaments making headlines, and the founder of Women's Golf Day (WGD) Elisa Gaudet believes this can be a pivotal moment for the game. With the first women’s Major of the year, the ANA Inspiration; the Jordan Mixed Open where two men’s Tours and the Ladies European Tour come together to compete on the same course for the same prize fund; and the debut for the Augusta National Women’s Amateur, all swinging into action this weekend, many people will get their first exposure to the game. 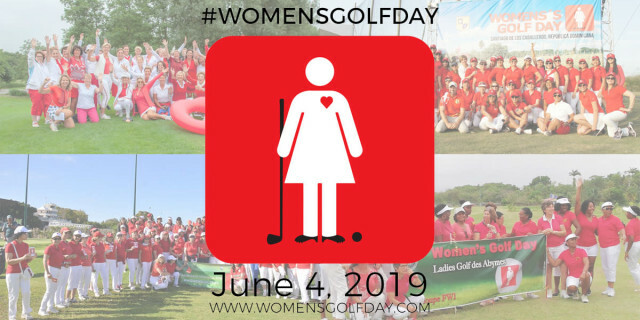 If, as Gaudet suggests, the effect of these three tournaments coming together in one week is to expose a new audience to the women’s game and kindle an interest in participation, then the return of Women’s Golf Day on June 4th 2019 will provide the perfect opportunity for women and girls all over the world to take the next step, Gaudet continues. In the past three years WGD events have been held at over 900 venues in 52 countries and have delivered a golf experience to over 50,000 women and girls. This year’s event will be held on June 4th and will once again be a celebration of women and girls learning golf skills that last a lifetime and of being part of a larger global community. WGD has partnered with PLAY for P.I.N.K – BCRF (Breast Cancer Research Foundation) an important charity partner given breast cancer effects so many women around the world. We encourage the Women's Golf Day events to have a charity component and raise awareness and funds for breast cancer and where possible work with Play for P.I.N.K – BCRF enabling them to continue their important work funding the world’s top researchers. For anyone inspired by the events taking place this week or simply anyone who wants to get involved with a WGD event, keep an eye on the WGD social media at @womensgolfday and #WomensGolfDay and check into www.womensgolfday.com for news of new venues signing up around the world every day.